When we were offered the one of a kind opportunity of dining at noma Tulum with American Express, we knew we couldn’t pass it up. We had heard such great things about Tulum, the incredible beach, the cenotes, the Mayan ruins and most importantly, the food. So we decided to add on a few extra days before the event in order to really experience Tulum. As soon as we arrived, we hit the ground running, more like, we hit the ground bicycling. We cruised up and down the hotel strip along the beach that’s filled with restaurants, shops and hotels that range from luxury clean aesthetics to open aired beach huts and everything in between. Since I’m cramming an entire trip into one blogpost, I’ve document each day with where we stayed, what we ate, the activities we did and what I wore. We stayed at Sanara which had come recommended by a friend of ours. We arrived into Tulum around 2pm. I actually had no idea that our flight from Atlanta would be so short (another reason to head back down soon). I guess I’m used to flying to Europe where the flights are so long and you lose hours. The drive from Cancun Airport to Tulum is around 1:45. Arriving at lunchtime we were quite hungry. We’d avoided airplane snacking in order to hold out for the guacamole at the end of the Mexican rainbow. After checking into our room, we made our way to have lunch at the restaurant at Sanara, called The Real Coconut. Everything on the menu has some kind of coconut in it and it’s all incredibly healthy and delicious. A great start to our first afternoon and was followed by some sun on the beach and bodysurfing in the warm, blue ocean. We weren’t too hungry for dinner, so we rode our bicycles to Nomade and had margaritas and mojitos on a beach swing while we watched the sunset. Finally, when it was pitch black, we rode back to our hotel and sat down to make plans for the rest of the trip. When we are on trips, we like to use the first day to get a taste of what the possibilities are. While we could research more about activities and restaurants before arriving to our locations, there’s no substitute for actually being there. After the sun was fully up and the restaurants started trickling open, we got back on our bikes to head to breakfast at RawLove. Thomas and I both went for their bowls- I ordered one with papaya, ginger, turmeric, passionfruit and banana, while Thomas got the classic acai. The star of the show, in my opinion, was the matcha green tea latte with coconut milk! One of the things we liked the most about Tulum, which is hard to say the same thing about when traveling elsewhere, is the large variety of healthier food options. Even if you aren’t a health nut that only eats raw food, you’ll still appreciate not feeling weighed down by every meal. After doing some exploring around the shops in the area, we hit the beach at our hotel. I’m not very good at relaxing on the beach, although I wish I was. After about 15 minutes of reading, I’m ready to get up and do something. Thomas loves being in the water, so we spent a good hour body surfing, which felt so amazing in the warm water of Tulum. We worked up quite the appetite and ordered some smoothies and guacamole while we dried off. For a late(ish) lunch, we headed to Posada Margherita. You might be thinking, ‘Why would you eat Italian food in Mexico?’. We were thinking the same thing when we followed a million recommendations to go here, but we totally get why now. The fresh pasta was incredible and the snapper (which was the catch of the day) was absolutely delicious. Totally worth the break from Mexican food (which is not something we say lightly). The space is also really beautiful and sits looking out at the ocean. We ended the evening with dinner at Gitano. Originally recommended for drinks, we wound up here after discovering we’d have no chance of getting into Hartwood, everyone’s hands down favorite dinner spot in Tulum (but requires a few hours wait before opening to put your name on reservation list, which we did not do). Gitano turned out to be wonderful. We ordered the full fish with taco sides (fresh tortillas, salsa trio and cabbage) and sides of sweet potatoes and cauliflower in mole sauce. The meal was unforgettable and one that Thomas swears he will try and recreate someday. We’ve said it before and we will say it again, the best time to see the most touristy places are as soon as they opened. We woke up early to a few rain showers but decided to hop in a taxi in order to arrive at the Tulum Mayan Ruins right at opening time (8am). Luckily, as soon as we arrived, the rain clouds departed and we had the ruins nearly all to ourselves. In fact, we spent about an hour at the ruins, and when we left, people were coming in by the hundreds via buses. The ruins are definitely an impressive site, every time we visit these ancient cities we can’t help but wonder what life would have been like back then, with a little bit of imagination it’s fun to picture these ruins during the height of the Mayan civilization. Hungry from our walk around the ruins, we set course for breakfast at Nomade. The decor at Nomade was probably my favorite of any hotel that we wandered onto. I loved the Moroccan vibes with the rugs, low tables and bean bags for sitting in the restaurant. Our breakfast did not disappoint, there’s nothing quite like a fruit platter when visiting somewhere tropical like Mexico. Having made our way back and forth to Nomade a few times we noticed a drink stand called Matcha Mama. Later that day we slipped into our swimsuits and headed back out for a couple cold Matcha concoctions in order to cool off from the heat and humidity before heading back to the beach for the afternoon. While enjoying our teas, we asked for lunch recommendations. The lovely woman working there mentioned Casa Violeta as her favorite spot by far. Feeling not too hungry, but unwilling to skip a meal in this culinary wonderland, we took a chance on her recommendation. We walked along the beach to Casa Violeta, not far from Sanara and perched up at the best seat in the house, our own little cabana on the beach. With too many options to choose from, we did what anyone would do, we ordered way too much food. We got chips and guac, ceviche, two orders of fish tacos, quesadillas and margaritas. Let’s just say, this time our eyes were exactly the same size as our stomachs…we polished everything off and wished there was room for more! Later that evening we got dressed up and grabbed drinks at Be Tulum. We got lucky because they had a fabulous jazz singer performing on the beach at sunset. It was such a peaceful way to end the day. Afterwards we decided to end the night early and order room service instead of going out. Sometimes that’s the best option! We ended up spending about an hour and at half at the cenote and only saw one other couple that came for about ten minutes and then a group of guys who showed up just as we were leaving. It was a treat to have the whole place to ourselves that morning (and luckily the mornings are hot enough to want to get in the water!). Afterwards we jumped back in the taxi and we headed back to Raw Love for round two of smoothie bowls and matcha lattes. After washing off back at Sanara, we spent the rest of the morning/afternoon shopping in the town, which I shared in this post. We relaxed the rest of the afternoon and hung out with the Amex team, eating fish tacos on the beach and getting excited for the upcoming activities we had planned with them. We ended the day with drinks at Casa Jaguar followed by a delicious vegan dinner at Restaurare, where we ate…..more tacos! Our final full day was the grand finale of what had been an incredible trip so far. In case you missed my Instagram’s and IG Stories, we spent the entire day with the team from noma. noma, in case you don’t know, is a restaurant based in Copenhagen, Denmark, that is consistently ranked in the top 5 in the world. Having won the top spot in 2010, 2011, 2012 and 2014. Their restaurant in Copenhagen was closed as they prepare to open in an all new space, so it’s chef, René Redzepi, decided to open a 7 week pop-up restaurant in Tulum. What seems like only a 2 month commitment, is actually a lot more than that. They spent over 9 months searching Mexico for the greatest ingredients they could find, sourcing things like wild fruit that’s too rare to be commercially cultivated or mezcal that’s made in such small quantities that it isn’t for sale! They built everything in the restaurant, tables, chairs, utensils, cups, you name it, they thought about it. We started off the day with an amazing brunch, which was followed by René sharing the story of noma Tulum. We had read all of the accolades the restaurant had received and spoken with a few people that dined nights before us, but it wasn’t until listening to René that I realized we were in for a real treat. Even if I didn’t like a single dish from the whole day, (which was not the case) it’s so rare to be in the presence of collective expertise that I knew I had to soak up as much as possible. After the speech, we met at the restaurant for what turned out to be my favorite part of the whole day. We spent about an hour sampling mezcal and tasting the long list of unique ingredients that noma chefs would be using later that evening. The back stories behind each of the ingredients were fascinating. Naturally, my favorite was the chocolate made only from white cacao beans, which come from a variety of cacao, that produces a very small percentage of white beans. The final course during the dinner was a chile pepper filled with chocolate ice cream made with that special chocolate. After the ingredient tasting we met for tacos, because you have to have at least one meal with tacos per day in Mexico, and then we had a few hours to chill and relax before our dining experience that evening. Finally, it was time for dinner and apparently, time for the thunderstorm to start. It poured rain but of course, noma had a back up plan. They sat us in the kitchen at the chef’s table. It was the perfect vantage point to enjoy our amazing 15 course dinner. I won’t go into detail of each dish and what we ate, because that could be a whole blog post on its own, but the entire experience was incredible. Actually seeing the chefs prepare and make each dish, with the tedious amounts of effort that go into the smallest of things, it made us sit in awe. It was a true art form. As lovers of Chefs Table, we felt like we were living in a real-life episode (if you’ve seen them, then you know what I mean!). Sadly the next morning we were packed up and off to the airport. But alas, we already have another Mexico trip in the works….! In love with your perfect vacation looks! it looks like an amazing stay! The most beautiful view and delicious food! It looks like you had such an incredible time in Tulum! Thanks for the brilliant itinerary! Oh my!! Inspiration to the max!! I have the biggest travel bug right now thanks to your post! Majestic photos, amazing outfits, super delicious food and in overall the vibe of Tulum is incredible. awesome pictures! love your photos and your looks!! WOW! That’s an amazing summary of the trip! Thank you for sharing! Love all the maxi dresses you were wearing! They blended in so well with the surroundings. Your style is incredible. You are always the perfect clothes. Matching the surrounding as well as the country. 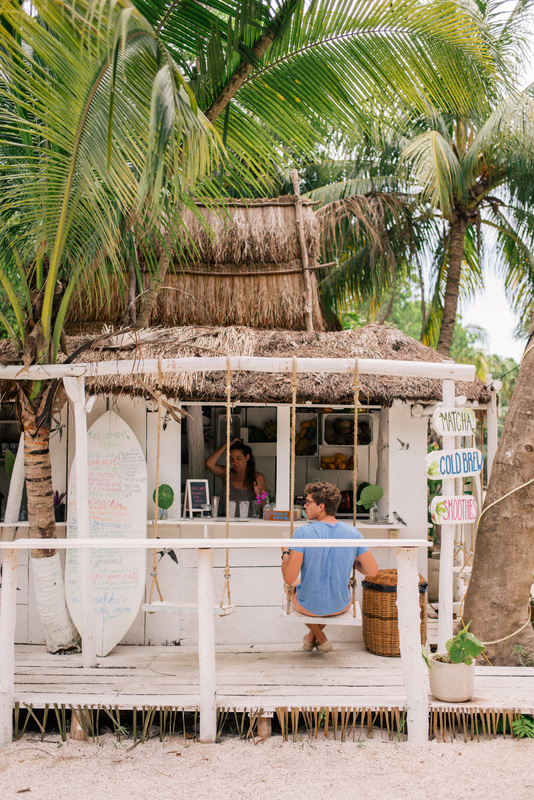 These pics are so dreamy and loving your wardrobe in Tulum. Amazing post. Beautiful picture, love all your outfits as well! So colorful! Il love this post and just want to go to Tulum! Love this guide! amazing location & pictures. What an amazing vacation! I’m obsessed with all of your outfits! I think I want to take a trip to Tulum after you shared it in your Stories and these photos just confirmed it! Thank you for sharing this travel guide. Will for sure come in handy in the future! These pics are stunning! I love all your outfits. My husband and I went to Cancun this past March and loved it so much. We had the best service, food, and weather! We will definitely be going back. We are looking into Playa del Carmen. Everything look amazing Julia! So many great outfits, delicious foods, and beautiful views. Wow that all looks so amazing, especially the food-haha! I’ll defiantly have to consider this as my next travel destination! Thanks for sharing! I’m so in love with Tuluum! The food, the views… it’s spectacular. Love every single image you shared. Beautiful! This sounds like it was an incredible experience! I am dying to go to Tulum… it looks like an amazing place! Tulum looks wonderful! I’ve been to Mexico twice and Tulum is next on my list. Thanks for the great recommendations! The food looks so gooodddd! When I travel eating healthy food is such a treat . Thank you for sharing I will add those nice spots for my next trip! Love the format of this post! And as always, your pictures are stunning! Loved reading this. Check out my SS17 trend report! This is so incredible and inspiring! My husband and I are thinking of going to Tulum for our 1 year anniversary and this just really got me excited! What a beautiful and idyllic place. Love your day 5 look <3 so beautiful ! I’m sad you didn’t go to the Hartwood, it’s literally the best. Everything looks magical! Lovely post!! Love Tulum, your post makes me yearn to get back there! Fantastic photos! This is an amazing detailed post on your trip to Tulum! I’m sharing all your recommendations with my husband now so we can plan our next trip there! P.S. what type of transportation did you use between the airport to hotel? Sounds and looks like it was an amazing trip! Tulum was on my list for this year, but I’ve been hesitant to commit due to the Zika warnings in Mexico. I’m curious how you take those warnings into account when traveling to places with them? Were the mosquitos bad when you were there? I know this sounds a little random and maybe paranoid! Haha, but I’m that girl who gets bit 23 times before my husband gets a single bite! Oh my goodness. I want to go to Tulum!!!!!! It’s absolutely beautiful!!!!!!!! Adore all the photos, outfits, food photos and cute dresses. If I went there I would totally make sure I swam in the swimming hole! Absolutely LOVING this guide. It’s been a goal of mine to visit Tulum for quite some time. Very inspiring! Oh my, Tulum looks amazing!! SO gorgeous! This is definitely on my list of places to visit soon!! Holy Guacamole! This post makes me seriously crave tacos, bare feet, warm sand, and a salt water breeze, SO BAD! And I’m not normally one who loves hot weather. This looks so relaxing! The photos are beautiful too, as always. I hope to one day be able to travel a lot, like you. I would definitely take all of your recommendations into consideration! I want to go to them all!! I’m glad you had a great trip :) Thank you for sharing your experiences with us! wow – this guide was insanely helpful!!! So many details I have to bookmark – thanks so much!!! Just sent this to the boyfriend – need to get to Tulum ASAP. I am so glad you and T had so much fun. This looks so lovely lady! This blog post is one of my favorites ever! Loved the way you broke it down into each day and it made me wish I was there 😍. Thank you so much for sharing. This was a wonderful read!! Thank you so much! It was a wonderful trip! I buy 90% online, but do love to find things is small boutiques every now and then. I check what’s new and coming out a few times a week if I have time in the morning. I’ll also have my eye out for specific things when we’re traveling, and I’m pretty good at researching to find exactly what I’m looking for! This post was amazing Julia, it was so through and I loved the variety of outfits. It looks like you and T had an amazing time and the Mexican food has me drooling over here! How do you pack your hats for travel without ruining their shape? I’m getting ready for a beach trip and really want to take my favorite sun hat but don’t know how to keep it safe. Thanks! Love this post! You write so beautifully. Thank you for sharing, you are both very inspiring! I would have never thought to visit Tulum but after seeing all these beautiful photos it’s moved to the top of my list! Thank you so much, Cecilia! Honestly, I don’t really let that affect my travels. I know a lot of people are incredibly cautious, I probably should be too, but I didn’t really think about it. There were a lot of mosquitos and I did get bit, but they also have a lot of sprays and methods of trying to keep the mosquitos away. I’m so sad, too! I wish we would have had the patience to line up at 3 to get a reservation when they opened at 5:30 (all of our friends who have done it said it was worth it). We kept walking by in hopes that we could snag a table last minute, but every time they were completely booked. Next time though! We’ll make it our mission! We had a driver waiting for us at the airport. This is one trip where we did not rent a car and we definitely didn’t need one. I really love and enjoy your travel posts! Amazing job! OMG! It looks like a dream! These photos are so beautiful and so are all your outfits! Can’t wait to visit Tulum! WOW, This trip looks incredibly beautiful. Cenote Cristal is unbelievable. Hi Julia. Loved the post, I am from Mexico and never been to tulum, i am planning on going for my birthday this october. Do you recomend sanara? Or did you like other hotels better. I am undecided between sanara, be tulum and nomade. You reply would be of much help. Thank you very much! All of your photos are making me miss Mexico so much! :) Haha especially the food photos! <3 Next time, I'll definitely have to visit Tulum as well! And oh my, all of the sunsets are so pretty! Your posts are always such a visual treat! Love them! What a great experience. I love Chef’s Table. We just recently ate at White Rabbit in Moscow, featured in season 3. Tulum is the most gorgeous place on earth and seeing your pictures I wanna return right away. Cannot wait for my third time there! Thanks for this lovely guide. I am just enchanted but the colors, the light, the vistas…thank you for sharing in such detail! Such beautiful, beautiful photos. Your outfits seemed to be a perfect mix of your personal style mixed with a dash of flavor from the location – love! You write so beautifully. Makes me wish I were there! Thoroughly enjoyed reading about your Tulum experience. My Girlfriend and I just returned from Tulum a week and a half ago. Wish we had seen your blog prior to going. We had a great time but missed out on some of the gems you were able to experience. We stayed at the Grand Oasis Tulum. We visited the Mayan Ruins (the same one you visited). Also, we had the opportunity to zip line through the Mexican rainforest on our way to swim in some cenotes in some caves. It was beautiful and definitely a worth while experience. We also visited Xel-Ha which was an exciting and unexpected treat. We had no idea Tulum had such an adventurous water park. Finally, we were able to visit downtown Tulum. Someone suggested Barracuda’s. I enjoyed the fish tacos but unfortunately I don’t think my girlfriend was impressed with her meal. But, you look like you did so much more. You seem to have taken advantage of EVERYTHING Tulum had to offer. Now you’re making me want to plan another trip back. ;-) Thanks for sharing. Tulum looks too amazing, dying to go someday! We just hiked Mayan Ruins in Belize last week, what an experience! I love your crochet beach cover up. Where did you get this from? Love this post, Julia!! Absolutely beautiful and now I’m so excited, as I am headed to Tulum (staying at Mi Amor) in December. Do you recommend reservations at most the restaurants or are walks in welcome? Thanks so much! You’re going to have an AMAZING time! Mi Amor looks gorgeous- that’s where some of our friends stayed. We actually didn’t make reservations anywhere, it’s pretty easy to get in/most don’t take reservations. But, it is helpful to make a list and at least try, just in case! I got it years ago from a little beach shop and it actually has no label in it- it was super inexpensive. Sadly, I don’t have much more information than that. Your travel diary for Mexico is amazing! I cannot wait to see this beautiful country in a few weeks. Thank you for the inspiration! If you don’t mind me asking, what camera do you use for your photos? Now all I want is fish tacos… Your post was filled with so many foods options, with no generic over-stereotyped ones. Great post! Tulum looks like an absolute paradise! I am dying to get to Mexico, but slow and steady wins the race! And that brown twin set and pink dress are absolutely GORGEOUS! I really enjoyed reading your travel guide! I recently came back from Mexico City and can’t wait to go visit Tulum the second time around. That skirt/blouse duo is a must! Happy Travels to you! You guys are the cutest! Love that bright pink dress you’re wearing. Now I just need to plan a trip here with my hubby! What an amazing trip! I’ve never been to Tulum but this post makes me want to make the trip as all of your photos are gorgeous! Your trip looks incredible! And all the food looks amazing! This … is AMAZING! I don’t know how I missed this post since I receive all your emails and subscribe, but I truly enjoyed reading through this post and will reference for future travels. Thank you!! LOVED all of your beautiful photos and the wonderful details about each place you visited. My husband and I went to Tulum last fall and loved it so much that we’re returning this fall for a longer stay! It really is a special place…indescribable really…but you did an amazing job detailing your meals and adventures (and you looked effortlessly beautiful! Wish I could manage that…staying at Piedra Escondita this time, no hair dryers, curling irons allowed 😕) Just wanted to thank you for this post…we will definitely be using some of your recommendations during our trip! Your Tulum guide has been so helpful! We are going in October and can’t wait! Did you all rent a car and drive to Tulum? We are trying to determine the best way to get their and think having a car to explore all of the cenotes will be helpful too. Would love your feedback! Thanks! Next time you go to Tulum you should try diving with professional divers in one of the cenotes. We went to Dos Ojos with Koox: http://www.kooxdiving.com/en/ and it was the best experience of my life. It is an underwater heaven. Hi Julia! What camera and lens are you guys shooting with? You easily have some of the best blog photos i’ve ever seen. Thanks in advance! I’m just wondering how you pack your various hats for a beach vacation? Love the pics! My husband and I are wanting to take a trip to Tulum and are looking at Sanara! What time of year did you go and was the hotel packed at all?